Diagnosed in 1964 with an amyotrophic lateral sclerosis (ALS), the British Stephen Hawking constantly challenged his disability throughout his life, finding alternative ways to communicate and become a world-renowned scientist. "My hopes were reduced to zero when I was 21. Everything that has happened since then is just a bonus," he told the New York Times in 2004, referring to his illness. In announcing his diagnosis, the doctors said he was only a few years old. The disease progressively deprived him of mobility and confined him to a wheelchair, almost completely paralyzed and unable to speak, except through a vocal synthesizer. "I lived five decades longer than the doctors had foretold. I tried to make good use of my time," he said in 2013 during the presentation of "Hawking," an autobiographical documentary. "Because the whole day may be the last, I have the desire to make the most of every minute," he explained. In spite of his deficiency, the scientist knew how to multiply the supports to share his discoveries on the secrets of the Universe. 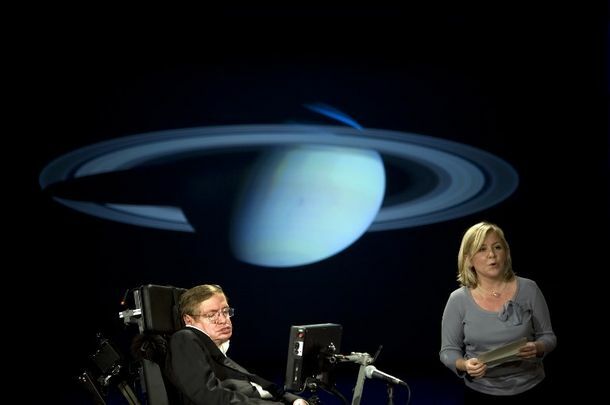 Through writing scientific articles as well as an international bestseller, "A Brief History of Time," Stephen Hawking was able to express his genius and share his findings about black holes with surprising ease. This popular scientific publication, launched in 1988, sold more than 10 million copies and has been translated into 35 languages. It addresses the creation of the Universe and its development and the laws that govern it in simple language. Accessible to the uninitiated, the book helped make the recognized scientist a major public figure in research both in the UK and abroad. "The Theory of Everything," which also chronicles his fight against the disease, has been adapted to the film and the award-winning film at the Oscars and Golden Globes in 2015. Eddie Redmayne was awarded the Oscar for best actor for his incredible interpretation of a Hawking young and dreamy, despite the misfortunes. Stephen Hawking's fame even made him participate in tv series like "Star Trek" and "The Big Bang Theory", and the researcher has its own character in "The Simpsons". So many commitments taken in parallel with his brilliant career at Cambridge University, where he was notoriously the holder of the chair of Lucasian professor, a chair of mathematics occupied in his time by Isaac Newton, father of the theory of universal gravity. "My deficiency has not been an important limitation for my research in my field, which is theoretical physics," he said in the journal Science Digest in 1984. "It helped me in a way, by stepping away from lectures and all the administrative work I should have done otherwise. " In recent years, he has continued his work of disseminating scientific research, being active in social networks. Followed by almost 30,000 people on Twitter, it was especially present on Facebook, where 4.1 million people signed up to receive their publications. Stephen Hawking had explained that it was thanks to the support of his family that he could maintain this rhythm of activity. "I succeeded thanks to the considerable help I received from my wife, my children, my colleagues and students," he had pointed out. After his death, some of his words resonate as a testament. "For millions of years, man lived as an animal, then something happened that released the power of our imagination." We learned to speak and to listen. (...) With the technology we have, the possibilities are endless. All we have to do is make sure we keep talking, "concluded Stephen Hawking.